I am so excited about our upcoming Bee Happy Sew Along with Lori Holt from Riley Blake! Many of you know I got to go to Utah last month to a shop owners quilt retreat with Lori. I had the best time making friends with other quilters from all over the USA! I got to see a lot of Lori's quilts and learn her techniques which I am really excited about teaching to EllaKate's Quilters! Beginning Monday, August 28th, you will be able to download the FREE PATTERN each week and Lori will be teaching each block on her blog. On Tuesday, the following evening, from 6:00 till 8:00 pm, EllaKate's will be hosting a Bee Happy Sew Along for local quilters. We will sew along with Lori each week on Tuesday evenings. This will give us a time to share any questions anyone might have and work together as we create our own Bee Happy Quilts. This is going to be so much fun!!! It is important for you to get your Bee Happy Quilt Kit BEFORE the first Sew Along on August 28th so you will be prepared for this great adventure to begin! When you purchase your kit ($189.99) from EllaKate's, I will share preparatory information so you can get started now! All of the fabrics are in stock at EllaKate's so once we hear from you, we can get your quilt kit cut immediately. The colors are so "Happy"!!! Rise and Shine...It's Quilt Market Time! This is Jo Morton telling her about her new book, Jo's Little Favorite's II. She had all the little quilts there and we got to see them. You know EllaKate's has this book already on the way for you to see! By the way Jo is such a sweet person. She gave me a big hug after we met. This is another class with Jo Morton. She has another new book, "Simple Friendships" that she did with Kim Diehl. Kim could not be at market so they had her face on a puppet stick and held it up for all to see. If you look closely you will see it in the Martingale Book Representatives' hand. It was pretty funny! "Simple Friendships" is beautiful! How can it not be...Jo Morton and Kim Diehl! You can check it out at EllaKate's. I know, I know, all of you who love brights are wondering if I forgot you. Well never fear, here is "Me and My Sister" from Moda showing us their new Dresden Plate Ruler and numerous quilts that can be made from it. I will post more later. For now mark your calendar for FUN & FABULOUS FRIDAY, June 9th. or give me a shout if you would like to come on over before then! Rise N Shine, It's Quilting Time! The Block of the Month Quilt Along by Katja Marek is so much fun!!! We have made it easy for you to join us if you would like! First you need the "Perpetual Calendar". This calendar includes the directions for English Paper Piecing and a hexagon pattern for each day of the year. You will not be making a block each day but you have all these patterns to use for other projects if you like. To complete the Perpetual Calendar Quilt, you actually make six of the same block from only one specific day in each of the twelve months. If you do not want to draw off your patterns then you can get the paper pieces from EllaKate's each month. Christie and I love them because we get to jump ahead to using fabrics instead of cutting out the paper patterns and they are all exact! Whew! Thank you Paper Pieces! This is the first block for January. We love the bright reds in our January kit! 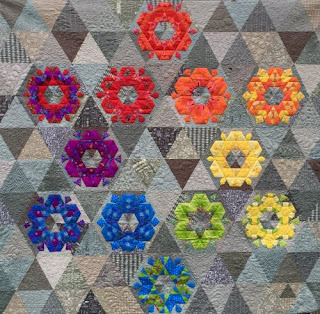 Notice that the January block is made up of six exact hexies (January 13th) that are joined together to form a wreath that is appliqued to the background. Then the wreath is surrounded by appliqued "jewels". The original quilt has a gray background but we decided to make ours light. The background is pieced triangles. We used the triangle template and cut our background from 11" strips. We are using different Moda fabrics to make our scrappy background. “Perpetually Hexie” is a FREE on-line Quilt Along that has a very active FaceBook page to keep you excited and engaged. Check it out to see what others are doing! So far we have three local quilters who are quilting along with us! Let me know if you have any questions but I'm warning you, IT IS ADDICTING! One of the best things is that it is so portable! The Perpetual Calendar February Block is a striking orange! We will keep you posted! I am also working on a new quilt for my bed. I absolutely love the colors! I started with the pattern "Plush Sampler" by Sandy Jarvis but it is not large enough for a bed quilt. So I am figuring it out as I go. Brave soul, right!?! So far this is how it looks. Brrrrrrr. Baby it's cold outside in Martin, Tennessee!!! I looked outside this morning to find the lake frozen and a few ducks seeking warmth up next to my house. I think I scared the ducks when I opened the back door so off they flew! I'm really looking forward to our upcoming Quilt Retreat scheduled for Friday and Saturday, February 3-4, 2017. We will meet on Friday evening 6 till 9 and all day Saturday 8 till 5. Get your kit for the retreat and the schedule for the weekend at Fun & Fabulous Friday on January 13th! This is going to be soooooo much fun!!! This is the fat eighth bundle we will be working with. These are the border fabrics and the fat eighth bundle before unpackaged. This quilt reminds me of stained glass windows. The colors are so pretty! Be sure to check it out at Fun & Fabulous Friday in January!! !